Top 8 Branded Counter Display Ideas You Need To See! The goal of setting up a branded counter display is to drive impulse purchase. Because they are located near check-out counters, they practically invite customers to make additional purchase. Take a look at Lotte for example- a popular chewing gum brand. 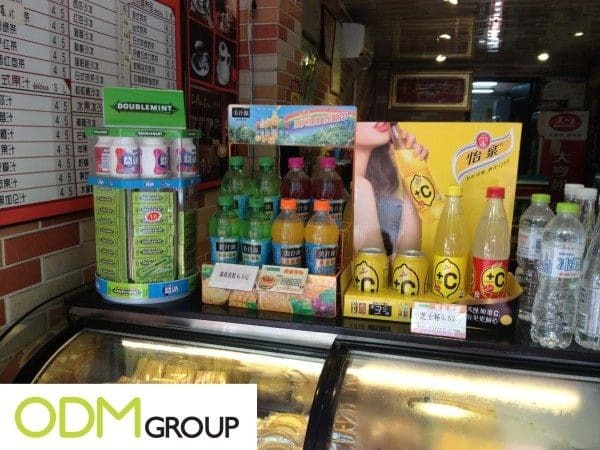 They have used a branded counter display to showcase their line of products at a convenience store in Vietnam. Lotte has used a simple square shelf display with decks. It looks functional and is custom designed to make sure the products fit nicely. If you want a more bespoke counter display, we rounded up some of our favorite counter display designs from our previous blogs. 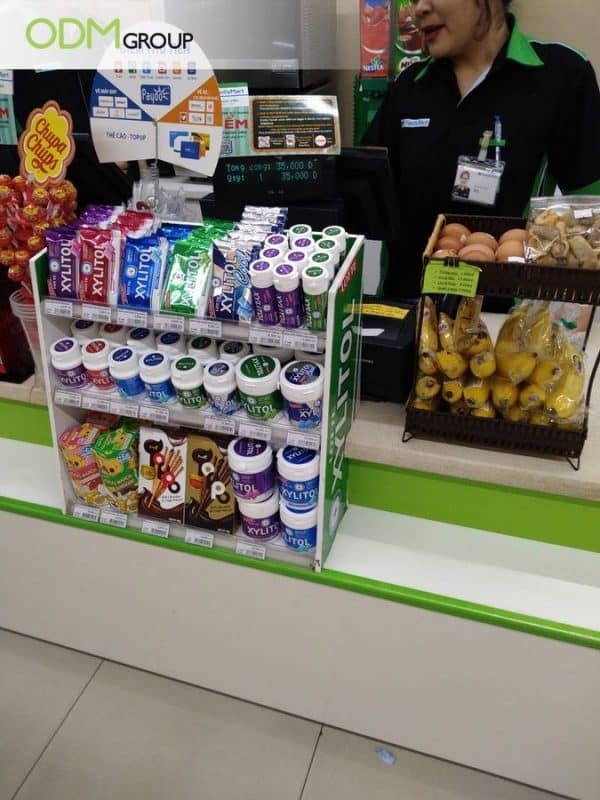 The Wellcome Supermarket in Hong Kong used a POP counter display and purchase with purchase offer to bump up sales. Why do we love this counter display idea? The cartoon plush toy is a popular character, which immediately attracts customers to the display! And the “limited edition” bags on offer are practical and reusable which means, customers can use them for shopping. 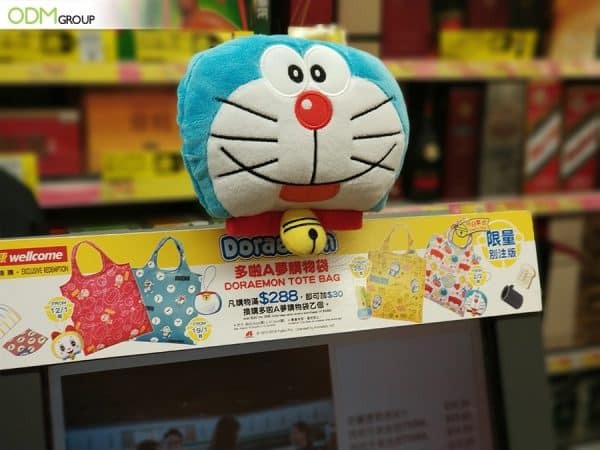 Doraemon is a popular character so naturally it has a solid fan base who would no doubt shell out an additional $30 to get the limited edition shopping tote bag. So this means increased sales for the supermarket. 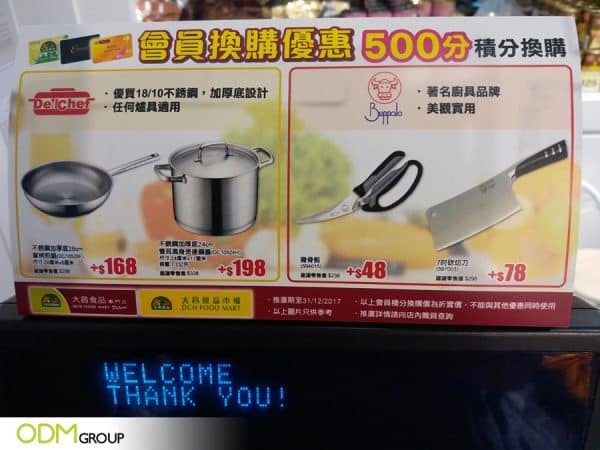 This counter display by Buffalo and Deli Chef effectively promoted its purchase with purchase offer in a supermarket in Hong Kong. 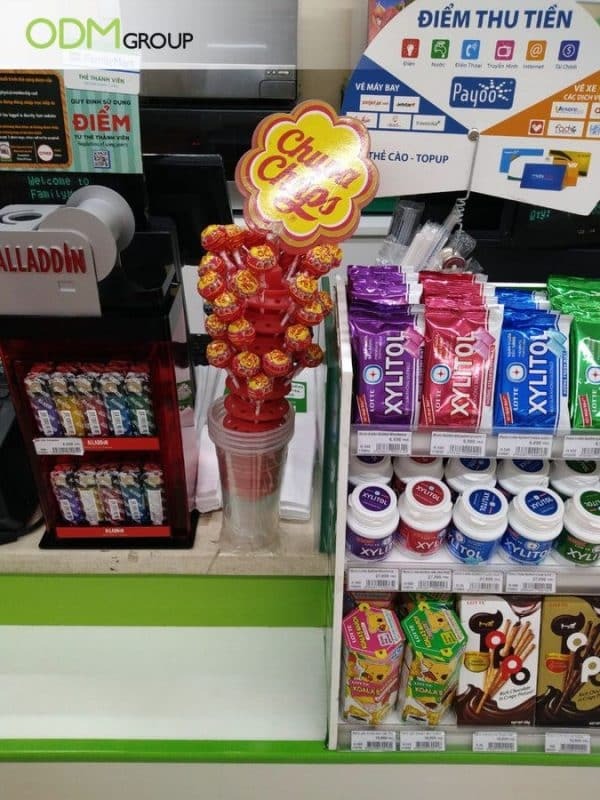 It may not be the usual counter POP display that looks like a mini shelf, but this delivered their brand message nonetheless. We love this display offer because it benefits both brands and the supermarket. This offer generates impulse sales for the supermarket as customers seek to get the free products. Buffalo and Deli Chef also benefited from this scheme as their brand exposure is increased from this promotion. 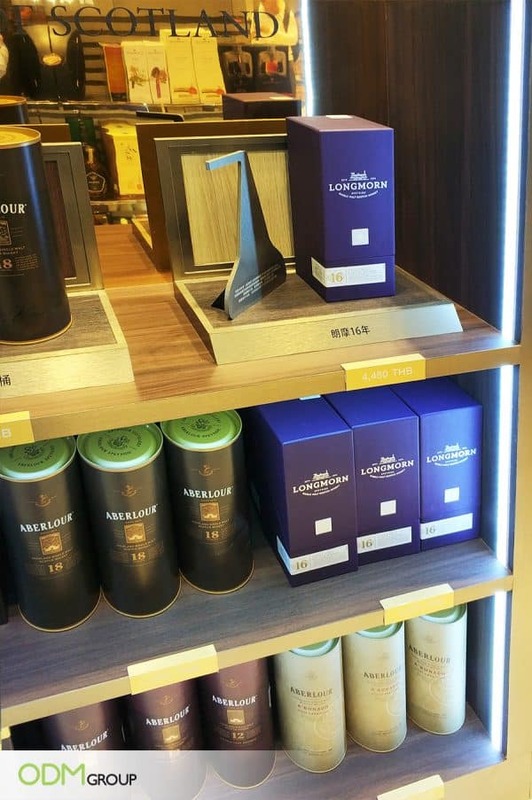 We love this retail counter display by scotch brands Aberlour, Longmorn, and The Glenlivet. We love it because the simple design and gold finish add a classy feel. This is really ideal for luxury products that target high-end customers. 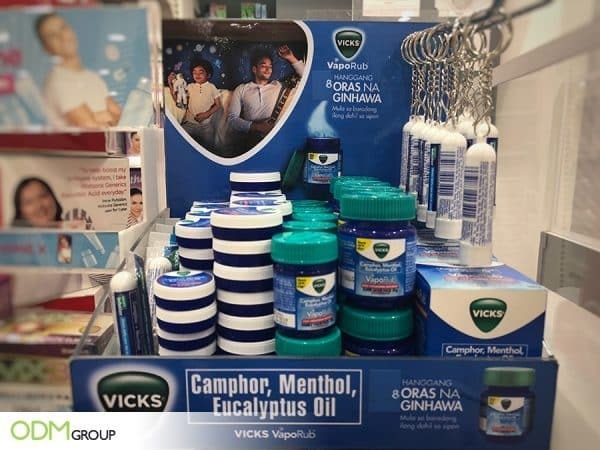 We love this custom POS display idea by Vicks because it showcases all of Vicks’ products. This gives customers a variety of choices if they want to purchase one of Vicks’ products. Moreover, the color is truly striking. Because it is small and compact, it does not take up much space. Moreover, placing this near the check out counter will definitely increase the chances of customers making additional purchases. 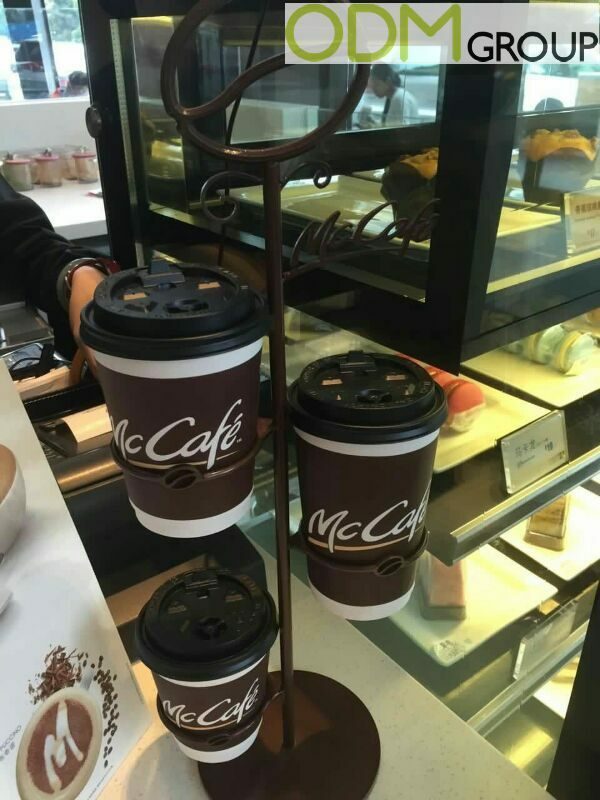 This McCafe drinks display is certainly clever. Why? Because the presence of the coffee cup at the cashier would tempt customers to purchase a drink. This is especially so if they have ordered some desserts, in which case a coffee would complement perfectly! This is different from ordinary counter POS displays we’ve seen before but it’s very effective, sturdy and distinctive. Here at ODM, we love the use of a counter top display to promote a product. Why? This is because a counter top POS display idea provides great opportunities for customization. As seen from the photos, the materials can vary. Wrigley’s is a cylindrical revolving unit that allows customers to choose products with ease. The other two displays are ,ade from corrugated cardboard with full print. 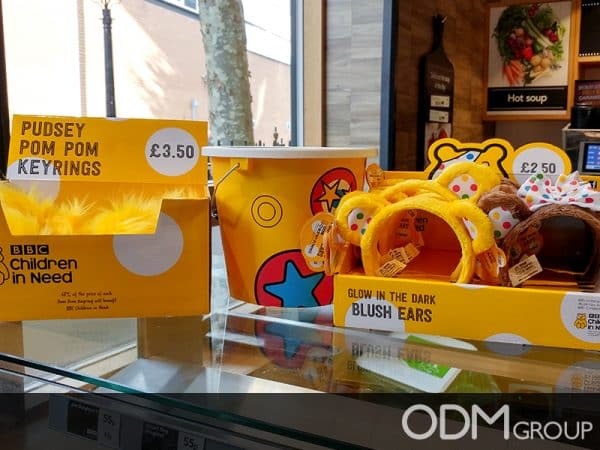 In this case study, BBC has used a custom counter display to promote its charity merchandise, for its charity Children in Need. We love this POS display idea as it supports a great cause, and is attractive. BBC has used an eye catching display, and effectively used its mascot for all their merchandise. This would help to instill good values in children who see the mascots, as they are taught to help the needy. 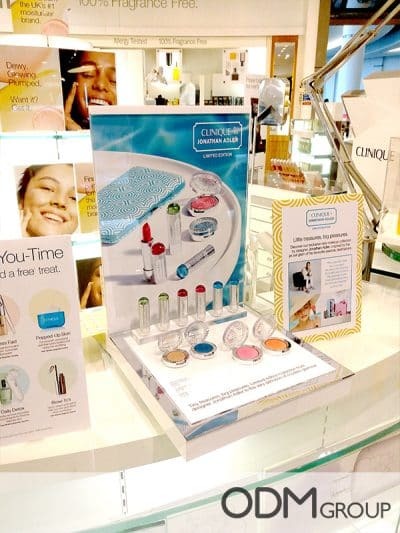 Here is a case study on a counter display used in a cosmetics shop. 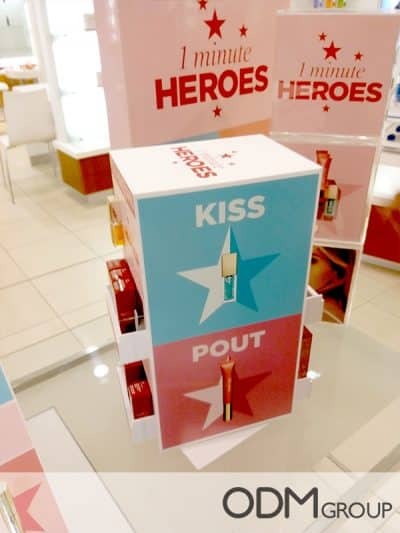 In this display, Clinique has marketed its new line of lipsticks near its counter. We love this POS display stand because it instantly catches the attention. This is because the display clearly displays the new lipsticks, and even has samples for consumers to test out. This will attract customers to try out the product, and purchase it if they are impressed. Moreover, the choice of color and the lighting added glam to to the set up. Clarin’s rotating on-shelf display, which promotes its newest products, is unique and attractive. It also provides buyers convenient access to the products they want to buy by rotating the display stand. The vibrant colour gives off a youthful and fun feeling. Having an advert stand at the back also make them even more noticeable. All in all, branded counter displays can act as a great marketing tool for your company if used correctly. If used correctly, it has the potential to wow customers, and attract them to make purchases from your brand. Interested in using a counter display to boost your company’s sales? Feel free to contact us today! Here at ODM, we specialize in promotional displays, so you can ensure that your next project will be a success! We also specialize in promotional products and gifts, so do enquire if you have any promotional projects in the pipeline. Want to learn how to create a highly effective counter display? Click on this blog to find out the tips on manufacturing a killer POS counter display! Aside from counter displays, a custom display is also highly effective in generating sales. Check out Chivas’ custom liquor display now! Click on this blog to find out how your company can use a free standing store display to its advantage, and generate higher sales revenue!